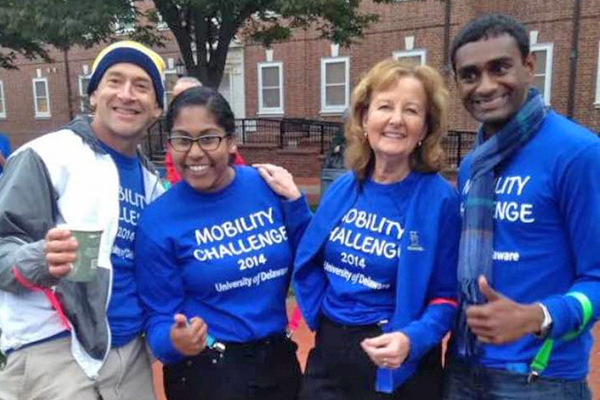 Cole Galloway, Naimisha Movva, College of Health Science Dean Kathy Matt and Vinu Rajendran at last year's "Mobility Challenge." 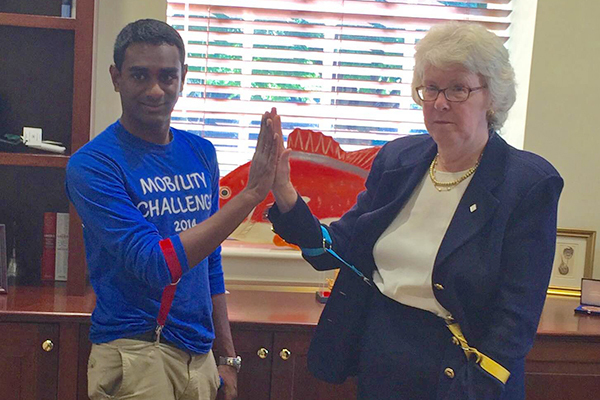 Vinu Rajendran and UD Acting President Nancy Targett demonstrate the straps representing arthrogryposis. 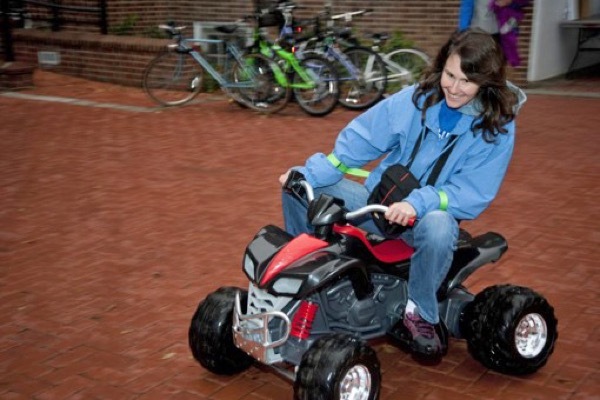 The "Mobility Challenge" field event from 4 to 7 p.m. will feature adult “ride-on-car” races. 11:44 a.m., Oct. 13, 2015--Assistive Medical Technologies at the University of Delaware has a challenge for members of the campus community. On Wednesday, Oct. 21, “Mobility Challenge” will highlight the impact of mobility restrictions in daily life. Building on a wildly successful event in 2014, participants can take one of four challenges this year  stairs (to exhibit the challenges of wheelchairs), straps (arthrogryposis), sticks (stereotype) and silence (the social impact of a disability). “The Mobility Challenge gets people thinking, gets them noticing that the mobility we take for granted is integral to how we socialize and perform daily activities,” says Naimisha Movva, co-organizer and senior biological sciences and psychological and brain sciences double major. Starting at 8 a.m., the challengers will take pictures of themselves completing everyday tasks in a photo scavenger hunt. Post and follow with the hashtag #MobilityChallenge2015. “Despite the fun and quirky atmosphere, it conveys serious undertones, vocalizing topics typically undiscussed and unconsidered,” says Vinu Rajendran, biomedical engineering major and president of the Assistive Medical Technologies student organization. The challenge is truly a campus-wide initiative with participants from all seven colleges. From 4 to 7 p.m. is a field event on the North Green and Central Green, which will feature adult “ride-on-car” races, the GoBabyGo Café, lawn sports, a DJ and plenty of food. The event is open to the entire UD community. To close the challenge, Cole Galloway will speak about the impact of mobility and what people can do to drive understanding and progress. “Mobility Challenge 2015 is where learning, challenge, fun and respect come together in a celebration of our human right of mobility,” says Galloway, professor of physical therapy and founder of GoBabyGo.